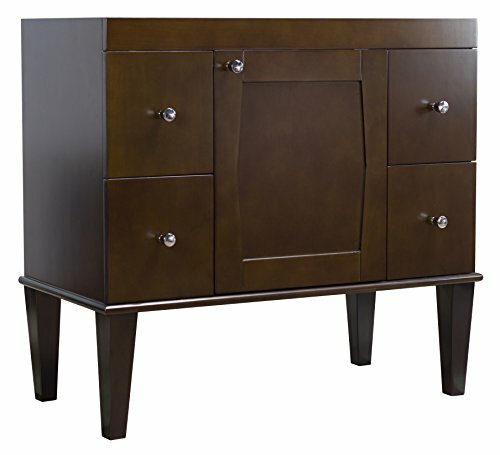 Features a large cabinet with a soft-close door. Fully adjustable in-out and up-down european style hinges that are completely concealed when door is closed. Four mid-sized full extension drawers. Drawers constructed with dove-tail joints. Cabinet hardware included. Undermount hidden drawer slides. Vanity base only, top not included. Can be installed as wall hung; the legs can be unscrewed from the vanity. Includes adjustable floor levelers under the legs for uneven floors. Knock-out plumbing backboard for easy water supply and drain access. Completely finished inside out; including back and inside the cabinet. No assembly required. Crafted with American birch wood and veneer. Solid wood frame. No MDF or chipboard used. Multi-layer 7-step stain finish enhances the grains of natural wood and gives it a luxury look. Completely finished inside out including back. Faucet and accessories not included. Drawers completely finished on the inside.